There are a lot of headlines lately about how companies are relocating to / expanding in Texas from California: Apple is creating 5,000 jobs in Austin, DJO is heading to Dallas, Amazon is adding a regional hub in Fort Worth. 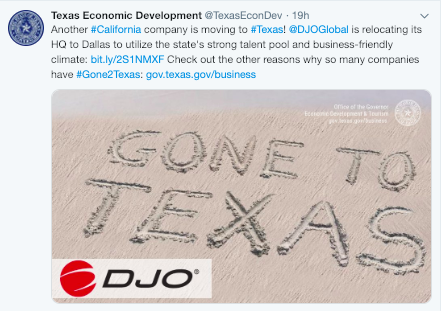 After time spent as a staffer in the Texas Governor’s Office in Economic Development and a decade+ since talking with tech firms large and small, I now know that terms like #biz-friendlyclimate & #talentpool are all rooted in #affordability. People want to live in cities that support their quality of life. If it’s too expensive, too difficult to get around, too challenging to simply live, they leave. Cool cities like San Fransisco and LA are teaching us that lesson. And Texas cities are reaping the rewards. But for every #GoneToTexas announcement, there seems to be comparable headlines warning about the escalating cost of living across the state. In Austin circa 2017, it took making $54, 631 a year to “live comfortably”. In 2018, that number rose to $73,163. That’s quite an increase which is cool if you’re a degreed tech professional in a tight market. Not so cool if you’re a single parent juggling jobs and praying the car doesn’t quit on you. Cost of Living in Austin, Texas, United States. Dec 2018 prices in Austin, Texas. Impact Hub Austin will showcase the results of its Affordability Accelerator on Monday, December 17. This platform provides resources and support to social entrepreneurs who are coming up with innovative approaches to the complex challenge of affordability. And it is difficult to raise private-sector sponsorships to support the hard work of this public-sector problem. 1 — To think hard about what the words around the celebration of economic development really mean. It’s rooted in affordability. 2 — To rally around / support community-focused organizations that are doing the hard work of addressing affordability issues. Please share and encourage others to join the conversation and get involved.